Don’t miss the scenic flight of a lifetime while you’re in Queenstown. 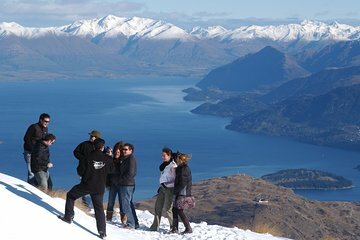 Board a helicopter for an aerial tour over the Remarkables mountain range and soak up the expansive views of sparkling Lake Wakatipu from above. Your 30-minute tour includes an alpine landing for the ultimate photo ops. Upgrade your experience with a private charter exclusive to your group, with your choice of Squirrel or Eurocopter EC chopper.